Fate/Stay Night is one of those franchises that needs very little introduction. TYPE-MOON's hit visual novel from 2004 was adapted for anime in 2006, and while the original series was good for the most part, the show suffered due to an inherent problem with any visual novel adaptation. Visual novels are a strange blending of anime, manga and games that, in a number of cases, allow the player a degree of choice over the events in the story (although there are some purely linear ones out there). The issue though, is that the same event may have several different outcomes that are dependent on the choices made within the game, and it's this aspect of many visual novels that causes the most problems when it comes to making an adaptation as the storyline for these types of games are generally lacking in certain areas. The first anime version of Fate/Stay Night, for example, didn't just follow the game's Saber arc but also included bits from the other two arcs as the plot was believed to be too weak to support a 26 episode TV series. Unlimited Blade Works, the second story arc from the game, has now been adapted as an anime movie, and unlike the TV series it promised to be a more faithful reproduction. The major question though, is whether the franchise works better in this format. Ostensibly, Unlimited Blade Works is an alternative retelling of the original story, with many of the fundamental plot points, characters and settings included. The major difference between the two though, lies in the aim of the plot. 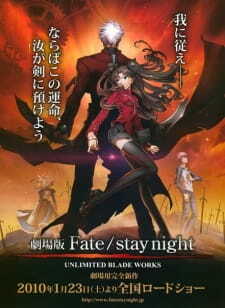 In the original Fate/Stay Night (or Saber Arc, whichever you fancy), the goal was to stop the creation of the Holy Grail and end the war once and for all, but Unlimited Blade Works only uses this as a peripheral concept, with the main story being about the relationship between Archer, Tohsaka Rin's noble phantasm, and Emiya Shirou. The main problem with the storyline is simply that it becomes too caught up in itself. While the basic concepts are good, the plot is far too reliant on knowledge of the previous anime series or the game itself. There are far too many occasions where no explanation is given for an action or event, a factor which doesn't help viewers with little to no knowledge of the franchise. Granted there is some effort made at the beginning of the movie to bring the casual viewer up to speed, but this is nowhere near enough to support the weight of the actual story. That said, fans of the franchise may find this entertaining viewing at the very least, however they may also find it lacking in certain areas, in particular where the characters are concerned as, again, Unlimited Blade Works relies too much on what has gone before. The problem with the characters is one that is fairly typical when it comes to movies - a lack of development, however the fact that this is an alternative retelling of an existing tale only serves to make this more pronounced. Both Rin and Shirou are decent enough characters for the most part, but one has to question why Shinji receives almost no development at all (and I never actually thought I would ever use that sentence when talking about anime), especially as a number of events in the story occur because of him. There seems to be a kind of blatant ignorance of every other character aside from Rin, Shirou and Archer in Unlimited Blade Works, which may be due to time constraints admittedly, but given the degree of overacting and the long, drawn out fight scenes, it should be asked if this is actually the case. In addition to this, Shirou's abilities seem to grow at an accelerated rate over the course of the movie, and while one may accept this as some innate ability, the lack of any back story where this is concerned makes it nothing more than a convenient addition to the plot. Be that as it may, this movie is looks very good for the most part. Studio DEEN have done a great job with Unlimited Blade works, but given that the director and most of the crew worked on the TV series, one might expect them to improve on their previous work. The animation is of a very high standard, and is a far cry from that of the TV series. The characters move very well, especially during the numerous combat scenes, and while they may look the same as always, their respective designs have been sharpened up. The settings have also undergone a degree of sharpening up, and are now more vivid and detailed than in previous versions of the story. That's not to say it's all good in the visuals department though. There are occasions during where the design logic simply doesn't make sense, Saber's evening gown being one of them. There are also occasions where the characters movements seem far more theatrical than is necessary, especially during several of the combat scenes. Which, strangely enough, brings me neatly on to the acting. Unlimited Blade Works uses many of the cast from the original series, which is generally a good sign for any retelling. Unfortunately the seiyuu have worked on many other projects over the last four years so their familiarity with the characters is not as good as it once was, and this shows in the amount of over acting in the movie. It seems as though the actors and actresses have focused more on the popularity of the franchise than the need to get the role right, and because of this it sounds as though they're trying too hard. In addition to this whichever bright spark decided that using English in certain scenes would be a good idea should be flogged as it seems totally unnatural, especially as it makes the character look foolish. As far as the music goes, the movie is well served with a selection of dramatic, classically themed pieces to enhance the numerous action scenes. The sound effects are also very well crafted and choreographed, although it should be pointed out that certain scenes can become overwhelming with the combination of speech, music and effects. On the whole, Unlimited Blade Works isn't a bad movie, but it's a far cry from being great either. The simple fact is that it's entertaining in its own right, but there's little there to recommend it to those unfamiliar with the franchise. That said, one could fairly watch it and find it works to a degree as a story, but only if they could forgive the lack of detail in the story, and the fact that the plot has several areas that needed further investigation. That said, everything about this film screams out that it is definitely one for fans of the franchise, and ultimately they'll be the judge of whether it's good or bad. The movie may have its flaws, but fans may find these are forgivable as the well choreographed action scenes may make up for a lot. It could be fair to say that this movie was made specifically for fans of the franchise in the first place, as the efforts to introduce newcomers to the series seem a bit slapdash. One final point is that while the TV series needed to borrow from the other game arcs in order to fill out the story, Unlimited Blade Works is almost the exact opposite, and because of this one has to wonder if the franchise would work better as a 13 episode series rather than either of its current iterations. At the very least there would be more time for explanations and the actors would be able to relax into their roles. Whatever the case may be, we shall have to wait for Heaven's Feel to find that out. Who is this for? Why was this even attempted?! Who the hell thought cramming 30 hours of story into a 90 minute movie was a great idea?! This "movie" is a disaster! If you have never heard of fate, you will be lost in this incomprehensible mess. If you have seen fate stay night by DEEN, the first third of the movie is a boring recap, the twists in the second act will be rubbish to you and in the third act... you will have an embarrassingly hilarious final fight and instead of a CG dragon you will get a CG dolphin. If you have read the visual novel, you will probably hate it the most, especially when there is a superior adaptation by ufotable you should watch instead. To sum this up (in case you don't want to read about me tearing this to shreds): this is a shiny pointless piece of crap that has no reason to exist exist other than to spoil twists in the novel and take 2 hours of your life. Unless you don't care at all about this franchise and just want to see flashy animation... stay away from this film. This film: Basis, TWIST TWIST TWIST TWIST TWIST DOLPHIN (WTF?) DEUS EX MACHINA! The pace is all over the place, sometimes you don't even know how characters got to places, nothing is explained, and there is no flow or consistency. 90 minutes trying to cram 30 hours... Ya... there is probably not going to be much room for development, but even if you know the characters you will be disappointed. The protagonist is an idiot who makes wrong choice after wrong choice, Archer (one of the other main characters) is an indecisive whore that switches sides every two minutes, Saber is reduced to a damsel in distress, Rin doesn't do anything smart, in the third act an "goldy archer" takes out two swords and charges in melee mode like a moron, ect. I kid you not, there isn't even a real conversation until 45 minutes into the film. Admittedly it looks really good. There is a particular amount of detail emphasized on the character models and it all looks great. However, considering that the remake has already bettered this movie in these regards belittles this complement. Really the best thing going for it. The soundtrack by Kenji Kawai is excellent, making the action feel more epic and exciting than it otherwise be. Oh, UBW, where should I start? UBW was probably one of the most anticipated movies, and I can't blame people for that - the original route in the Visual Novel was outstanding, touching, at one time keeping you at the edge of your seat, at another causing you to cry about the pain of the characters, the results of their unfortunate choices, their small mistakes or simply outstanding sacrifices. The movie made me remember that story, made me want to live through it again. Too bad it doesn't MAKE me live through it again. IMO the obvious mistake the creators did, was forcing 20 hours of game-play into 1,5 hour movie - at the same time being forced to cut some portions of the story in order to squeeze it into the time frame. A 3 part OVA would've been much better, but they decided to make a single movie, and cut things out. Unfortunately, the thing they cut was - of all things - the plot. First thing is, you can't have only plot-driving material in the movie, you need to join it together somehow. If you want to know what I mean, try launching any series, but watch only odd episodes (1,3,5,7...) - You'll somehow understand what the plot is about, but in the process you will lose the whole mood, the suspension of disbelief will be broken, because the story won't flow, it will be stitched together - If they really did not want to put in the portions in-between, they could've helped it if they worked around it. They didn't. And yes, watching an anime series with every second episode cut out will get you a pretty decent idea of what this movie is to the original VN route. But there's another problem - If you throw out all your character development, you also lose any attachment the audience might feel towards those characters. This is especially important in movies dealing with sacrifices, helping others by losing something precious to you. I hope this won't spoil too much, but there's one death in this anime that particularly hit me - in the VN it was display of honor, sacrifice and chivalry, and it really made me sad that that person died in the process - Now what hit me is that in the movie... I felt nothing. Absolutely nothing. I didn't get to know this character, I didn't establish a connection with him/her, so even though I know this scene should be sad and touching - I can't help, but not give a crap. Things in this movie just... happen, but I couldn't help but feel detached. And that's really a shame, because animation is superb. The fights are exciting, the visual effects are stunning, and the whole animation just feels so smooth and flowing - something I really lack in a lot of animes that have fights in them. It's really dynamic, but you can follow what's happening on screen, and made me jump in my chair a few times, visualizing I was blocking enemy strike :) That effect is something I saw in only a few series, and I personally think that this is how all fights should actually be done in animation. There might've been some inconsistencies, but it was nothing to make a drama out of - and if you look at the way they did the story, all other faults bleak in comparison. Sounds are... good I guess. I think I heard the original music from VN a few times which is a plus of course, all of the original actors are here... I'm not a sound specialist, so I can't say much, but I have nothing to throw against sounds. I like them. The movie actually gets A LOT better near the end, where - surprise, surprise - there isn't much plot to deal with, because for the most part it's just fights. My opinion? Watching TV series is the least you REALLY should do before seeing this - otherwise you won't get half of the things, because they aren't explained, as well you probably won't really understand characters' motivations and personalities. But in the end - I recommend to just go and read the VN, because there's just so much more to this story than what this movie presents. If I was to use this movie somehow, I'd cut out the fight scenes, remix them and input them into the VN as cut-scenes, and just remove everything else. All in all - considering the hype and my expectations - I am really disappointed by this movie. There are many times in anime where I've been left dry simply because I was out of the target audience. However, there is a time, rare that it may be, that an anime is created with absolutely no target audience in question. Unlimited Blade Works is lucky that I don't consider it a movie because it would be one of the worst, if not the worst anime movie I have ever seen. Unfortunately compiling a slide show of random fights without any well established context, background information, plot, scene transitioning, and character development does not qualify as an actual movie. First thing's first though and for an animated film, Unlimited Blade Works has pretty poor production values. This should not come as a shock, seeing as this is studio DEEN who are notorious for budget cutting anime, but it is nonetheless disappointing. Several times through the anime there is a constant abuse of distant still shots and camera rotation. The designs were mostly alright, but the worst issues are around Archer and Shirou's UBW, and Gilgamesh's Gates of Babylon where it initially renders the swords properly, but then turns them into glowing sticks flying across the screen. Personally, this is not appealing and is yet another corner costing by DEEN. The true problems of the movie are definitely the direction and content. Whoever thought that adapting a 10 plus hour long visual novel route, longer than the Fate route adapted in the original anime, was a good idea is extremely naive. It was clear from the onset that this movie could only ever serve to be a taste of this story to the original anime watchers, and/or a treat to the original VN players with the animation of many of UBW's few key scenes. But the execution of this entire film by DEEN was just horrible. Frankly, for any newcomer to the Fate/Stay Night universe, I'm not even sure how this film was in anyway comprehensible whether it be the plot, the characters, or even just the action. Many of the events of the first episode or two of the original Fate/Stay Night are quickly glossed over in but a mere few minutes, and to exasperate the problem, the plot never slowed down, if even for a moment. Each new scene began with a new character showing up, followed by a fight, concluding and then doing the same thing all over again in the next scene. There was no real established context, and each fight was fought for vaguely defined reasons at the beginning of the film (That one would only understand if they saw the original anime or played the VN). This is in no way, shape or form to show a movie. This is but a slide show of events. And what's worst, these events are not even a treat to the VN fans since they muck up so many of the plot details, that one cannot help but feel enraged. Whether it be how they disproportionately stronger Shirou is in the movie compared to the VN, the way Shirou and Archer fight, the quick conclusions of the battle, or especially the last fight in this movie, everything was so off detail from the VN that no VN player would be able to truly enjoy this anywhere near the level of their respective scenes in the VN. Not to mention that if you were a Rin fan before the movie you would have been severely disappointed by how much interplay between Shirou and Rin was cut out in this film as well. Perhaps some of the original anime waters could have managed to find some enjoyment in this film (Without any VN knowledge), but I can't imagine it can be seen as anything but a huge fan service movie with many random fight scenes between their beloved characters. It is my opinion that no matter what, this movie has to stand up on its own, and it is clear that it doesn't. Now before I finish, let me break down all the possible target audiences they could have went after, and why in the end, it was for none of them. You have people who have played the VN, people who have seen the original Fate/Stay Night anime, and then you have the people who are entirely new to Fate/Stay Night. A newcomer would find this movie utterly incomprehensible. An anime only viewer would find this film extremely confusing, borderline incomprehensible as well, but might enjoy the fights to a degree. A VN player would be utterly disgusted with this trash adaption. In any case, I think it is impossible to view this in anyway as good story telling, or top notch anime productions. DEEN is good at wrecking franchises for sure, and it seems they are no different with Fate/Stay Night.